Every day brings a new challenge. We take a bus from Ratna Park in Kathmandu, a parking lot swarming with old, rickety buses that blare tinny Nepali pop songs into the smoggy black sky. An older Nepali woman sits beside me and falls asleep, her head bobbing up and down on my shoulders with every bump we hit, with every curve around a dusty cliff we take. Our driver spits into a cup and fiddles with the radio station, oblivious, it seems to me, of the faulty brake or slipped wheel or missed turn that will end in sudden death. 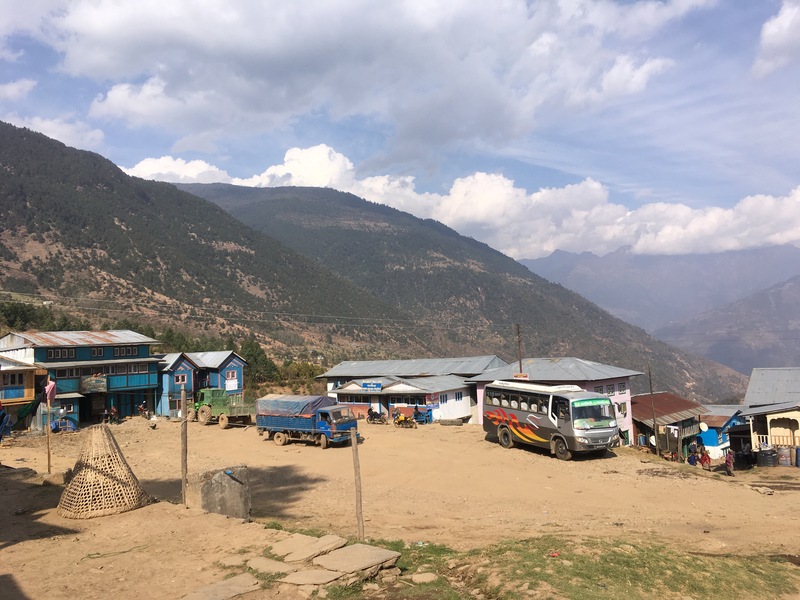 Ten hours later, I am stiff, my head bruised from banging against the window while I tried to sleep, my lungs filled with dust and exhaust from traveling the dirt road, but we are here, in Shivalaya, a tiny village that is the start of the trek to Everest Base Camp. My pack is too big. Emma and I notice immediately that the three other trekkers, men respectively from Germany, Finland, and Northern Ireland, hoist packs a third smaller than ours easily onto their backs. I struggle to lift mine off the bus. In the morning, when we begin the first ascent – an 800 meter climb up steep stone steps — I can barely lift one foot and place it in front of the next. The trekker from Germany is recovering from the flu, and his pace is faster than mine. Before I left for the trek, I wondered what I might think about during all that quiet hiking. Now I know: all I think about is the pain. The pain in my shoulders, in my calves, firing from the soles of my feet up my legs, through my back, and out my arms. I am pure pain. I only see the next step in front of me. But I will not give up. I discover a reserve of will power unknown to me and I climb that mountain, out of breath, my pulse pounding, my lungs screaming for air. 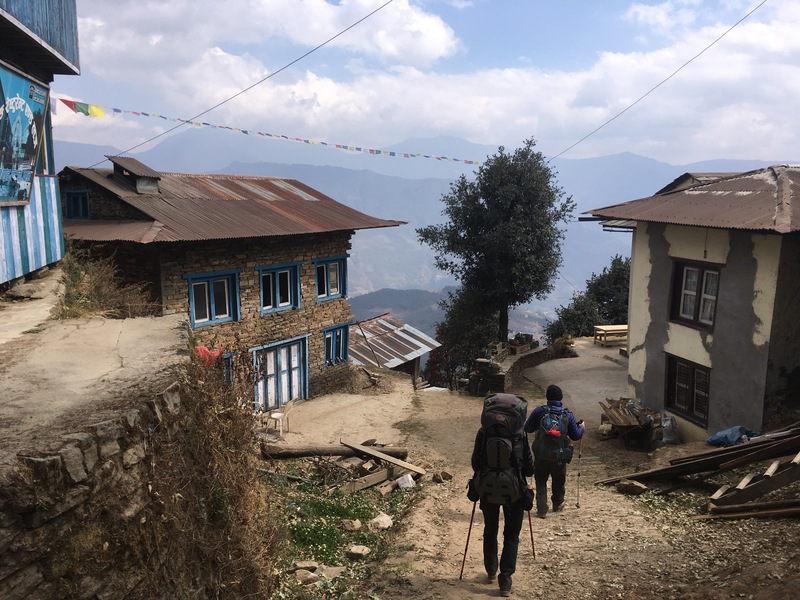 When I reach the top, a small village called Deurali, where the Finnish and Northern Ireland trekkers are finishing their Sherpa stew beside a flapping prayer flag, I collapse in a heap of gear. I am nothing but exhausted. I am nothing but the thought: get this pack off my back. The trekker from Germany is an ultra light hiker — that’s why his pack is so small. In a quaint lodge in Bhandar, where we spend the night, he helps me sort through all my gear. In the end, I leave a pile of almost ten pounds of unnecessary toiletries, snacks, clothing, and medicine behind. “It’s totally normal for your first trek,” he reassures me. He doesn’t need to; I’m not embarrassed. All I care is that my pack feels light as the thin air we will soon breathe. 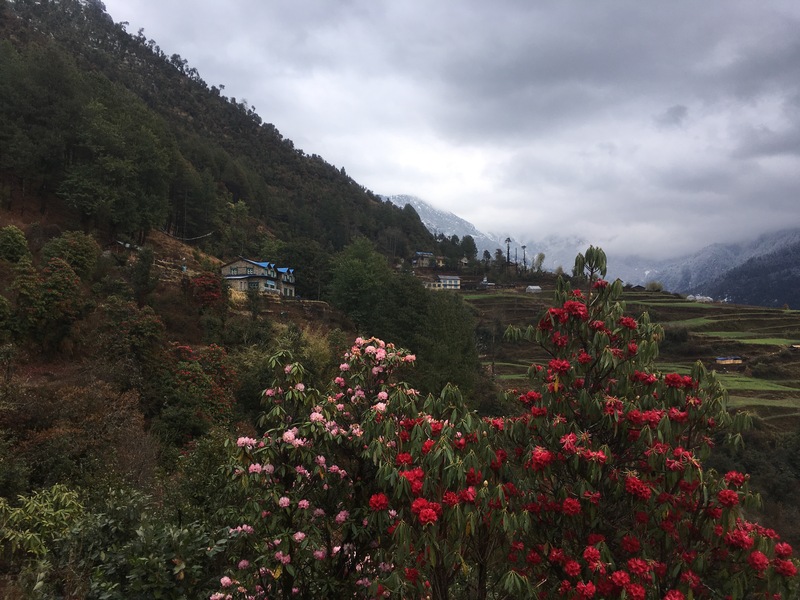 I can walk for miles, and we do walk far, across fields where goats chew grass and Nepali school children wave, “Namaste.” We walk up and down cliffs where the red rhododendrons grow. We lose the trail and a Nepali man digging a road out of the mountain with nothing more than a rusted pick helps us down a steep, sandy cliff to the trail below. Eventually, we walk all the way to a valley, intending to climb a mountain to stay in a village halfway to the top, but another Nepali man stops us. You won’t make it before dark, he says, and the weather looks bad. A few minutes later, we are warm in his lodge drinking fresh squeezed hot lemon tea while rain pummels the tin roof from a blackened sky. The next day, we climb that mountain in the rain. At first, the rain cools us. But soon, I realize: my jacket is not water proof. Nor are my boots. I am soaked through and shivering. A little farther, and we reach the snow line. The sky is angry gray clouds spilling over the ridge just above us, and we are climbing into it. Soon, we are ankle deep in snow. 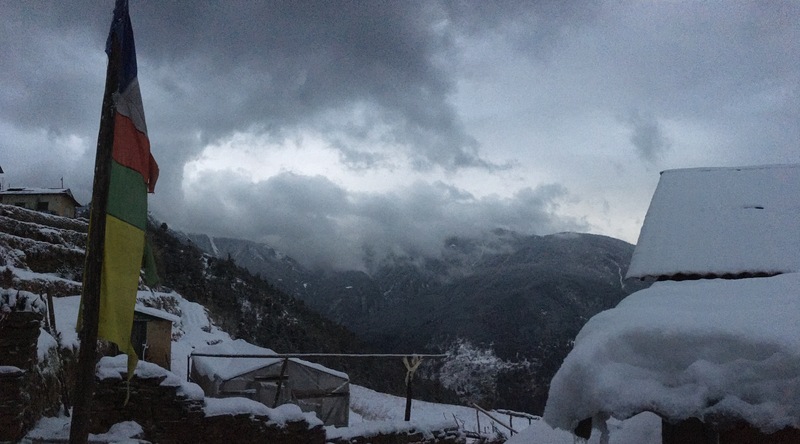 The mountains across the valley are dark and desolate, green pine trees shaded in snow clouds. We intend to reach the top of the mountain, but our friend from Germany has a headache and a bit of dizziness — the first signs of acute mountain sickness — and so we know we cannot go on. But where to stay? The lodge we find is nothing more than a drafty, cobwebby stable on the side of the mountain. Snow falls lightly through the cracks in the wood slats. Dust falls upon our sleeping bags, which we spread on two “beds” to keep warm — the “beds” are more like slabs of wood. I am freezing, down to the bone. My blood is ice, my fingers blue. Our Nepali hosts live in a bamboo and corrugated metal hovel with only a thin partition separating their fire where they cook from the barn where their yak lives. They are a couple in their seventies, but they look as old as the whole wide world. They huddle around their fire which smokes the room, leaving us red-eyed and congested. They used to own a lodge, but it fell in the earthquake, and now, this is what they have. 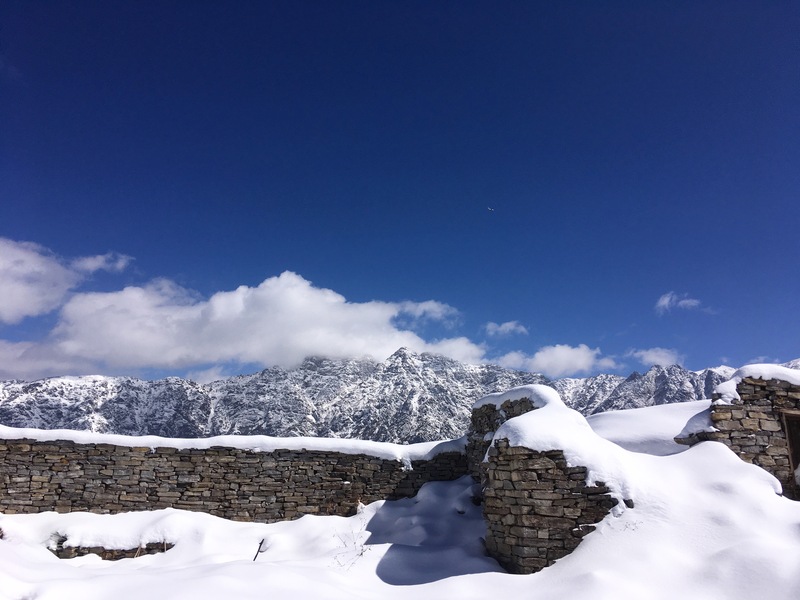 It is a miserable, cold, dirty, sleepless night, but it’s worth it to wake in the morning to a clear blue sky and the snowy Gaurishankur Mountain Range towering like a giant wall above us. For the first time, I realize: we are in the Himalayas. These mountains, these giants of the earth, they are real, and we stand small among them. I can’t believe you are doing this! Will be paying attention! Thanks for the update Elizabeth. You are currently reading Into the mountains at elizabeth hamilton.